We were appointed as landscape architects by a design & build contractor client on this new build residential development. Once our initial landscape design was signed off we tasked with the preparation of landscape architect ‘s information to submit to the Local Authority to satisfy Planning Conditions. The plot contained an existing building which had consent to be demolished and 6 flats to be built in its place. The topography of the site is steeply sloping from the back of the plot to the road frontage. It is bound on three sides by existing housing and has a number of existing trees on the boundary (all of which were to be retained). The landscape design accommodated vehicular parking for the flats within a dedicated open space to the building frontage. 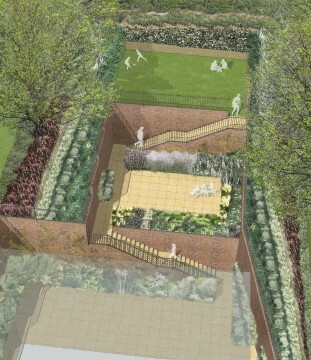 To the rear of the development a communal garden space was proposed. 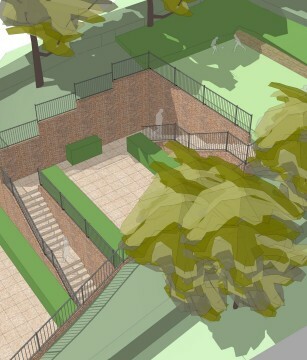 Our landscape design proposed that the rear garden be terraced to maximise the usable communal space. This also ensured that the amount of light entering the building at the lower level to the rear was optimised. 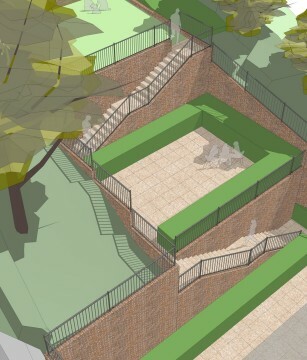 Our landscape architect’s proposed strained wires with climbers on the retaining walls facing the communal spaces. This design tool maximised both the scope for ornamental planting to the boundary and the the amount of usable amenity space. Our landscape architects gave careful consideration to the the existing trees to be retained. The soil levels within the root protection areas of the existing trees were unchanged and the locations of retaining structure were, as far as possible, located outside of their root protection areas.